Set at the height of ‘the Troubles’, the decades-long conflict that tore Northern Ireland apart with sporadic outbursts of shocking violence, 50 Dead Men Walking revolves around 22-year-old Martin McGartland, an informant within the Irish Republican Army. Based on McGartland’s best-selling memoir of the same name, the film covers the years 1987 to 1991, during which time McGartland claims approximately 50 lives were spared as a direct result of the intelligence he supplied to his British handlers. After this time, his cover blown, McGartland was kidnapped and tortured by IRA operatives, only managing to escape with his life in the most dramatic and unlikely of fashions. He’s been on the run ever since, though his time in hiding has been anything but restive; at one point he was reportedly changing location every month, and in 1999 he was shot six times in an attack he says was perpetrated by the IRA in retaliation for his years as an informant. 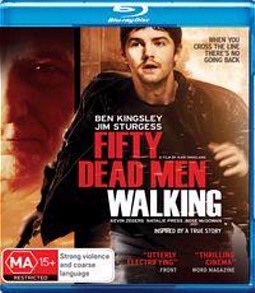 Though it received a limited theatrical release in the UK, 50 Dead Men Walking has gone straight to video in Australia, though as far as STV fare goes it’s top notch. Jim Sturgess (Across the Universe) puts in a captivating, star-making performance as the duplicitous larrikin trying to do the right thing, and Ben Kingsley is likewise convincing, if not his usual mesmerising self, as McGartland’s British contact. Rose MacGowan sounds like a drug-addled leprechaun in her unlikely turn as an IRA assassinette, but other than that the depth of talent is impressive, as is director Kari Skogland’s thoughtful cinematography and nail-biting action sequences. The Blu-ray release is light on extras, with a smattering of deleted scenes the sole incentive in this regard, but the 1080p picture and 5.1 TrueHD soundtrack are near-faultless, much like this highly-recommended feature.